Australia says in a new whitepaper that the country will not back down from its existing foreign policy values and alliances, despite the challenges posed by the rise of China and the feeling of uncertainty regarding the U.S. commitment to the region. Since its release on Nov. 24, Australia’s 2017 foreign policy whitepaper has drawn the attention and a wide range of interpretations from international observers. Australia’s Foreign Minister Julie Bishop, who has risen to prominence under the current Prime Minister Malcolm Turnbull and the previous Tony Abbott government, says in the whitepaper’s forward that it is time for Australia to reiterate its international position since the country’s last comprehensive foreign policy review in 2003. The 122-page whitepaper lays out the challenges facing Australia today: The continuing rise of China’s economy means that its military power and influence are “growing to match, and in some cases exceed, that of the United States.” Echoing U.S. President Trump’s use of the word “Indo-Pacific” to describe the areas of Western Pacific and the Indian Ocean, the whitepaper says that Australia’s future security and prosperity will hinge upon how the country deals with China’s rise in the Indo-Pacific region. 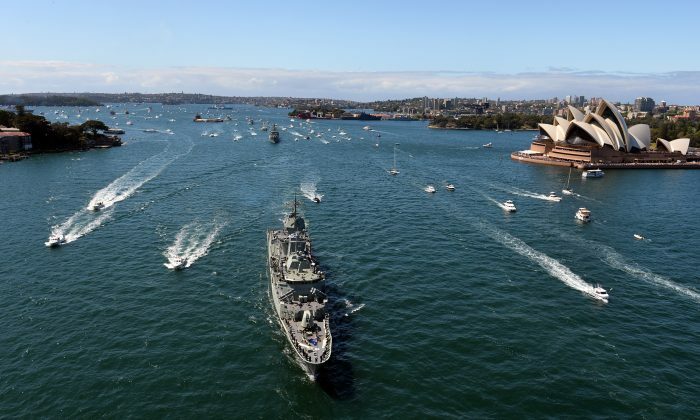 The whitepaper is significant because it does mark a shift in tone on Australia’s attitude towards China, said Ian Hall, Professor of International Relations at Australia’s Griffith University. Hall points out that the whitepaper’s tone is clearly set early on with the frank statement that, in Canberra’s view, “Today, China is challenging America’s position” in the region. 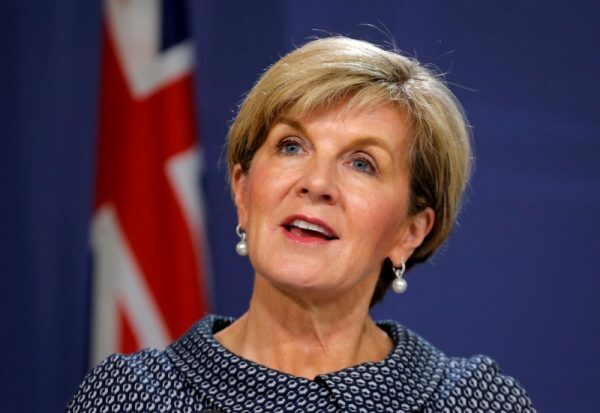 Under both Turnbull and the previous Abbott government, Australia’s Foreign Ministry led by Bishop has a track record of voicing Australia’s opposition to China’s growing aggressions and encroachments across the region. Australia was noted for its strong opposition to China’s declaration of an East China Sea Air Defense Identification Zone (ADIZ) in 2013, for example. It also strongly criticizes China’s building of artificial islands and other provocations in the South China Sea. Although the whitepaper says that smaller countries like Australia have difficulty influencing an international system that is “predominantly shaped by the actions of much larger nations,” it gives no hint that the country will cave in to China’s growing challenges. The whitepaper also says that the country is concerned about “the potential for the use of force or coercion in the East China Sea and Taiwan Strait,” alluding to China’s potential invasion of Taiwan, which Australia has not formally recognized. The whitepaper says that there is “greater debate and uncertainty” in the United States about the costs and benefits of its international leadership, alluding to the election of U.S. President Trump and the rise of populism which many have thought to be a potentially destabilizing factor in the U.S. commitment to its existing international posture. Australia is heavily dependent on China compared to other countries within the web of U.S. alliances. Beside the fact that China is Australia’s largest trading partner both in terms of import and export, at least 8 percent of Australians are of Chinese ethnicity according to the latest census. On top of that, more than 200,000 Chinese students are thought to be studying in Australia at any given time. The growing Chinese influence in Australia however, have been increasingly viewed in a negative light as the authoritarian nature of the Chinese regime and its political reach means that many Australians are becoming skeptical of China’s designs on their country. A series of high-profile investigative reports by Australian media in recent months have revealed the significant extent of the Chinese Communist Party’s control and influence over Australia’s political institutions, businesses, academia, and the Chinese students studying there. Bishop said in October that Australia welcomes Chinese students and visitors to the country—as long as they respect Australia’s liberal democracy and its values, such as the freedom of speech. The remark was believed to be partially a response to the growing reports of Chinese students on Australian campuses demanding to censor speech that is not aligned with Chinese regime’s propaganda. Australia’s top intelligence agency also warned in October that it has identified “a number of states and other actors conducting espionage and foreign interference against Australia,” without directly naming China. And while you’re here… we have a little favor to ask of you. We work hard to deliver important and interesting articles to you, but we can’t do it without ad revenue.